This allows complex content extraction in a flexible manner; the content to be grabbed can be a full web page or a set of tags. 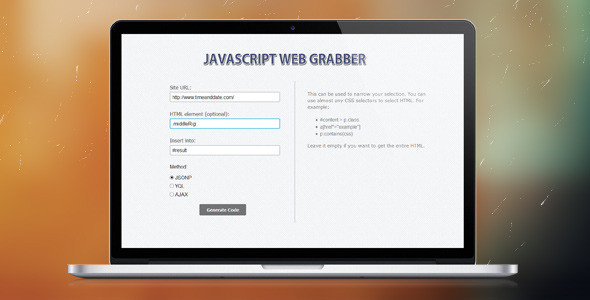 Upon purchasing this plugin, you will be provided excellent support by script developers, nothing is outsourced. JSONP – Allows cross domain JSONP access. The requested data will be processed by a remote server and will be sent back to your browser in JSON format. It requires less code than the other methods. YQL – This method uses the Yahoo Query Language (YQL) Web Service, which enables the app to access Internet data with SQL-like commands. The hourly cap is 2,000 requests/hour per IP, but you can register an API Key with Yahoo to increase it to 20,000 requests/hour per IP. Q. How can I get the entire page of a website? Q. There is a specific piece of HTML that I can’t get using your script. We assumes no responsibility for any abusive use of this software product and/or violation of any terms of usage of the grabbed web pages. If you decide to use this software product, do it with responsibility and make sure that you are allowed to display the grabbed HTML contents from the web page by checking its terms of usage. This software product is sold exclusively on codecanyon.net. Please do not download it from elsewhere.